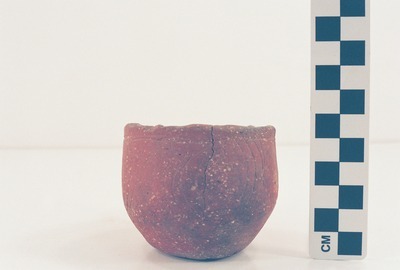 "41AN1-1, Burial E-1" by Timothy K. Perttula and Robert Z. Selden Jr.
DECORATION: The vessel has an engraved panel on the rim. Within the panel are four negative ovals. These negative ovals are defined by sets of three closely-spaced vertical curvilinear lines, and they also have triangular hatched areas at the upper and lower ends of the vertical lines. Vessel 41AN1-1, Poynor Engraved, var. Cook carinated bowl.